We were married! Our little plan had worked after all despite a few hitches in the beginning. As were walking back to the lodge from the river I had a chance to ask Zeb and Teresa where my wildflower bouquet came from. Remember the first photo from Part 5 showing Zeb and Teresa heading off somewhere? Those flowers were picked off the manure pile out back near the horse barn! Now it wasn’t a fresh manure pile, and they came from an “older” more composted section. But it goes to show you what a little compost can do in your garden! Needless to say, we didn’t save the flowers, but certainly enjoyed them nonetheless. And it’s a good thing I didn’t ask before the ceremony - I would have been thinking about that manure pile all during our vows. What was next? The crew had organized a little celebration on the lodge porch. Everyone from the wedding party attended as well as the dogs, and even the horses and mules were allowed to graze the grass around us. Teresa and Otis asked what kind of cake we wanted prior to coming. Why be normal we asked ourselves - let’s have what we really like - our two favorite pies - apple and pumpkin. We cracked some champagne and sparkling cider, made a few toasts, ate some pie, opened some unexpected gifts, then headed to change into our fishing gear. We strolled back down the path to the river and decided to head upstream. Along the way we passed the neighboring ranch, Red’s Horse Ranch. Red’s was first inhabited about 80 years ago and for a while was a guest ranch much like the Minam. Red’s also has its own landing strip just as the Minam, separated by a small hill, but directly in line with each other. Mr. Squash had spent time there years ago which is how we found out about the Minam Lodge. 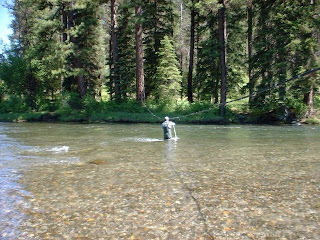 Red's was taken over by the Forest Service in 1994, and is maintained by volunteers with help from the Wallowa-Whitman National Forest and the Fish & Wildlife Service who rotate on a weekly basis from April to November. Once we reached the river, we fished for about a mile upstream. We caught some nice, fat rainbow trout and enjoyed the cool water as the afternoon grew hotter and hotter. Late in the day we were quite a ways upstream, so rather than fish the river back down as we often did, we decided to take the quickest route back on the horse trail. The trail was really dusty, not much rain had fallen. Walking behind Mr. Squash I was doing nothing but gulping big clouds of dust, so I slowed down my pace and told him I would catch up at the bridge. Alone on the trail I started to hear strange sounds - sort of like a very large bee sneezing! I knew it wasn’t a bear - they have a distinctive sound - what could it be? It grew closer at times and I was beginning to worry. There had been cougar sightings and if the bear were coming down from high country for food, so would the cougars. I quickened my pace and then I saw it - the cougar’s tail in the distant bushes near the river. Holy smokes - I hadn’t been married more than a few hours and I wasn’t going to make Mr. Squash a widower any time soon. I knew the bridge wasn’t far as I quickened my pace and there was Mr. Squash patiently waiting. I proceeded to tell him about the cougar, but it was really an “alleged” cougar because in fishing if you’ve caught a big one and your partner doesn’t see it, it becomes an “alleged” trout. Back at the lodge, dusty, dirty and tired, we found Otis and some new arrivals heading down to the river with all sorts of tools. What were they doing we asked? The water stopped running in the lodge, so that meant a break somewhere. With just a few folks at the lodge, a water line break isn’t an urgent matter. But tonight there were going to be guests coming in via the trail, dusty, tired and in need of a shower. And the next morning more guests were due to arrive via the airstrip which would make a full house. Cooking and washing up would be impossible without running water. Otis and his volunteer helpers followed the water line from the back of the lodge down to the river and couldn’t find the leak. They came back for more tools and headed to the hill across from the river so they could begin from the source of the spring and work their way back. A couple of hours later they came back to tell us the break turned out to be in the part of the line that is suspended across the river. You could tell Otis had tried to repair it as he was soaking wet from the waist down. Problem was, the water was really cold and he couldn’t stay in long enough to make the needed repair. It was then I realized I had packed a pair of chest waders – would they fit Otis? He squeezed and pushed his way into them and sure enough and in a short time, water was restored. Otis had filled many hats that day, preacher, lodge host, and water line repairman. Stay tuned for the final part of Minam River Wedding. We have one last exciting story to tell. I'm enjoying your wedding story. BTW - I love apple and pumpkin too - yum! Wedding bouquet out of the manure pile. I won't expect anything less from now on!! You know I've never even camped in my entire life...I need running hot water and an outlet for the hair dryer. And the only time I've been fishing my husband hooked my finger! I can't wait for the final chapter! Candace, this is so much fun to hear about. And the pictures--oh oh oh! (Can you tell I am in the city?--LA to be exact.) Anyway, the scenery is breathtaking. Thanks for sharing. PS I am a new reader. I linked to your blog from another quilter's blog--don't remember which one. Oh My! Nice your wedding didn't just pass by uneventful, after all you waited 50 years. Loving the story. Glad you are around to tell it and the alledged Cougar didn't ruin the story. The crystal clear water reminds me of the time many, many years ago when we hiked into the Kokanee Glacier in the middle of July to ski. Wecarried tin cups on our back packs and just dipped them into the glacial streams whenever we were thirsty. One of my friends caught a rainbow trout on a stick tied with string and a safety pin as a lure. It would appear that Minam Lodge and the Kokanee Glacier share many things in common. Thanks for stirring up the fond but distant memories Candace. Nooo, I do not want it to end! A fabulous day all in all Candace! It's such a beautiful wedding story! Oh, Candace! This is so wonderful and I am going to be so sorry when it is done! When you are all grown up when you get married, you can make your own choices even for the wedding pie! I think we would have liked a wedding like yours. Lots of excitement going on.